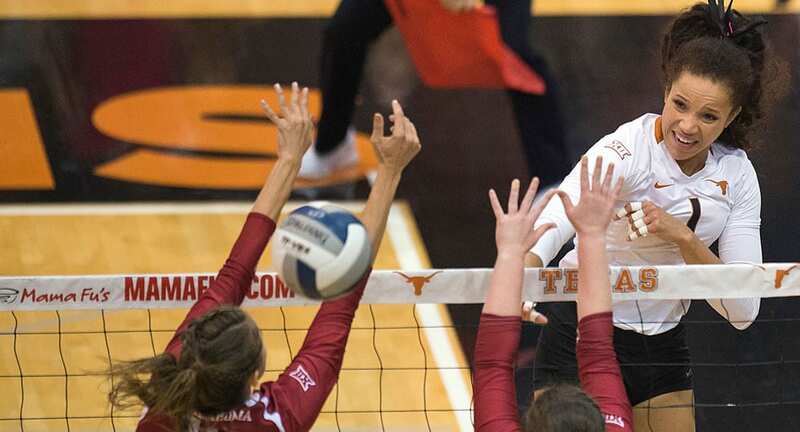 The Big 12's Player of the Year, Texas junior outside hitter Micaya White has been named Southwest Region Player of the Year by the American Volleyball Coaches Association (photo courtesy of texassports.com). AUSTIN, Texas — Texas junior outside hitter Micaya White has been named Southwest Region Player of the Year, the American Volleyball Coaches Association announced Tuesday. In addition, five Longhorns earned All-Southwest Region honors. White, senior outside hitter Yaasmeen Bedart-Ghani, freshman middle blocker Brionne Butler, and freshman outside hitter Logan Eggleston were named to the All-Region team, while senior middle blocker earned Honorable Mention honors. White leads the No. 5 Longhorns with 364 kills (3.87/set), hitting .306. She has 19 services aces (0.20/set), 227 digs (2.41/set) and 43 blocks (0.46/set). She also was named Big 12 Player of the Year, and this year’s selection to the All-Region team is her third in as many seasons at UT. Eggleston has 280 kills (3.01/set), hitting .272, 19 service aces (0.20/sest), 86 digs (0.92/set) and 48 blocks (0.52/set). Eggleston was named Big 12 Freshman of the Year. Butler leads the Longhorns in blocks with 112 (1.19/set), also with 192 kills (2.04/set), hitting (.358) and 49 digs (0.52/set). Bedart-Ghani leads the team in hitting percentage with 182 kills (2.64/set) with a .373 efficiency, also with 47 blocks (0.68/set) and 33 digs (0.48/set). Johnson has 100 blocks on the season (1.06/set) and 169 kills (1.80/set) hitting .364. All five players were also named to 2018 All-Big 12 teams.